Enjoy a great relaxing and fun visit to Ohope Beach - swim, surf, walk on the beach, kayak on pristine Ohiwa Estuary, walk to Otaraweirere Bay (20minutes), great fishing, visit White Island, day-trips to Tarawera Falls (and lake) and Te Kaha, bush walks, golf, surfing at West End etc - relax and enjoy this fantastic environment!! Very nice 1 bedroomed self-contained holiday flat with outlook onto lawn and gardens. Private, quiet and relaxing. Suitable for a couple. Guests often remark that the unit is much larger than shown on photos. Situated in a quiet cul-de-sac just a short 1 minute walk to excellent swimming beach. 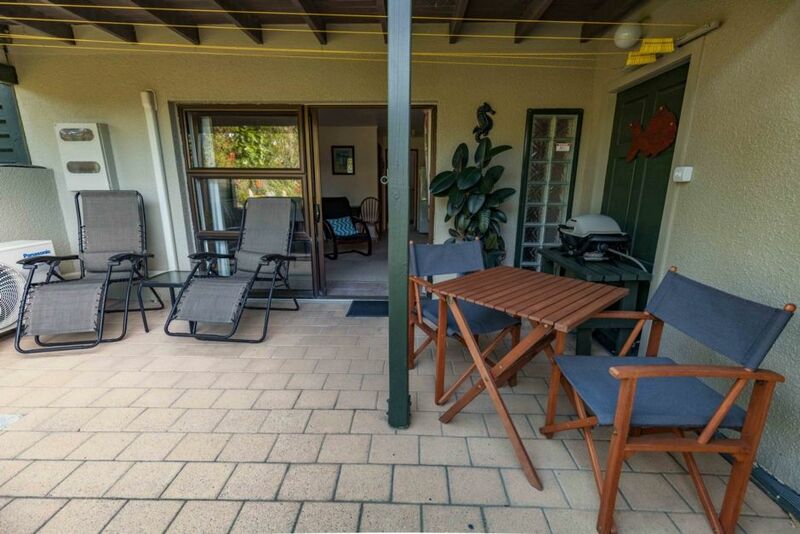 Sunny courtyard area with Weber barbeque, outside table and chairs, and 'zero gravity' relaxation chairs. 39" LED TV with Freeview satellite reception. Cooking with microwave, double hot plate (Weber Q1000 barbeque available on request). New heat pump now installed for cosy winter warmth. 3kg washing machine in bathroom. New - water filter installed for drinking water, New comfortable queen-sized bed. Please note that there is no cellphone coverage from within the unit. Ohiwa Harbour is close for snapper fishing, swimming, and canoeing. Shopping and fishing charters available from Whakatane (10kms away). Choice of many short bush walks at beach and Whakatane. Ohope Golf Course (listed by Listener as one of top 20 in NZ) short drive away, Awakeri Hot Springs 20 minutes drive, Tarawera Falls and Lake Tarawera outlet 50 minute drive. Bus service to Whakatane available at end of cul-de-sac. 2 night minimum. 30% (minimum one nights rent) deposit to confirm booking. Property was clean and tidy, although a little dated. Property was clean and tidy, although a little dated.. Good access and privacy. Cellphone coverage almost non-existent inside, but ok if you go outside. WiFi was good. Good shower..! Awesome spot close to the beach, spacious,private, has everything you need. Awesome spot close to the beach, spacious,private, has everything you need. Had a lovely stay. Comfortable unit and good location in Ohope. Comfortable unit and good location in Ohope. Everything you need for a short stay. Great space, nice set up. Great space, nice set up. Unfortunately the internet wasn't good. Value for money, excellent! Property was clean, tidy, had everything we wanted or needed and best of all ,one minute to the beach for an early morning walk on the best beach in New Zealand. We had a great stay! A comfortable, quiet and peaceful dwelling with a lovely nature outlook and Tui’s feeding right outside the bedroom window. Beach is 50 meters from the front door. I would highly recommend a stay here.